Lochranza is situated on the northern tip of the island of Arran, 13 miles north west of Brodick, the capital of Arran. Robert the Bruce landed here from Ireland in 1306. 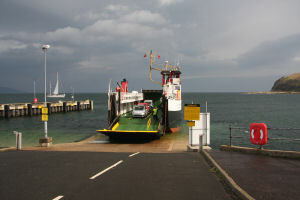 Lochranza has a regular ferry service throughout the summer, crossing to Claonaig on Kintyre. The jetty next to the slipway is used overnight by the Calmac vessel, whilst the southern side of the jetty is used occasionally by visiting yachts. An L-shaped pontoon has been recently installed (July 2008) for use by dinghies and small craft to load and unload passengers etc. The pontoon is only intended for short stays of up to three hours. A minimum depth of 2 metres is available alongside at all states of the tide.